Baker Book House held its annual Bible sale Saturday, Nov. 22. All in-stock Bibles were marked 50% off retail. Used books $15 and under also were half-price, and Bible covers and accessories were 30% off as well. Shoppers were spending, despite the cold weather in Grand Rapids, Michigan. 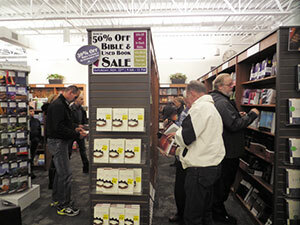 Louis McBride, Bible and academic book buyer, said it was the store’s best sale ever. Store Manager Sue Smith concurred. Smith reported the top-selling translations for the day were the New International Version (111 sold), the English Standard Version (65 sold), the New Living Translation (36 sold) and the King James Version (31 sold). One shopper bought 50 Bibles in a single transaction. Spanish Bibles also did well.